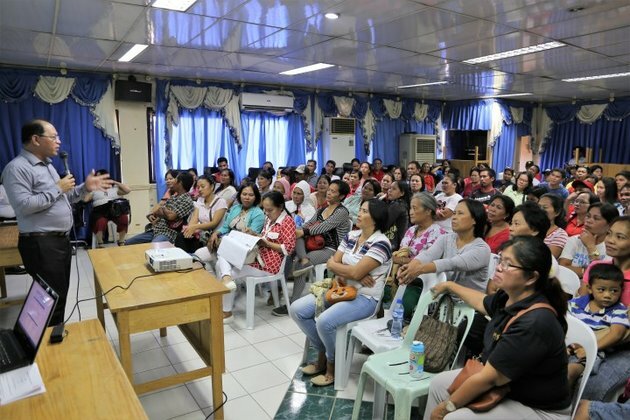 BUTUAN CITY, Jan. 18 -- The Department of Agriculture through the Agricultural Credit Policy Council (DA-ACPC) orients the 200 farmers and officers of farmers' associations in Butuan City on the Production Loan Easy Access (PLEA) Program. Together with the conduit institution, Cebu Peoples Cooperative (CPC), the activity aims to empower farmers and fisherfolk by providing them information on easy access to credit that they can use to finance the production of crops, livestock, poultry and fishing activities. The lending conduit serves as a channel where DA-ACPC can download the fund. It should have a lending system in place and acts to select, evaluate, approve and collect loans from borrowers under agreed guidelines with ACPC. "We thank the Department of Agriculture for this move in helping the farmers. We believe that this is an effective way to expand our production," said Vicente Paragua, the Farmers Sector Chairperson of Hugbong Federal Movement of the Philippines. CPC's Chief Executive Officer Macario Quevedo said that this lending program from the government truly in favors farmers since it only has an annual interest of 6% per annum with the least requirement among other loan programs. "Farmers should take advantage on this. They should rather avail on this program than borrowing money from institutions and individuals that would require higher interest," said Quevedo. Prospective borrowers should be registered or enrolled in the Registry System for Basic Sectors in Agriculture (RSBSA) and attend an orientation meeting about the program before he or she can apply for a loan. Borrowers can avail a loan of up to Php50,000 on this program and will have free insurance by the Philippine Crop Insurance Corporation (PCIP) covering the insurable agri-fishery crops and commodities. These individuals are encouraged to visit the cooperative and be assessed on the amount that they can borrow. "Only one person is allowed to borrow in every farming household," said Robilles. DA-ACPC Focal Person for Agusan del Norte Meliza Robilles said that there are already three lending conduits that the Department has accredited for this program in the province. The other two are the Mindanao Consolidated Cooperative Bank that already dispensed P5 Million to the farmers in Jabonga and Baug Carp Beneficiaries Multi-Purpose Cooperative that was downloaded P10 Million for the farmers in Kitcharao, Buenavista and Magallanes, Agusan del Norte.